The Xbox tab feature on Windows Live Messenger (formerly MSN Messenger), which I remember had existed a while back but never tried, has returned, based on Major Nelson’s post yesterday. After a little difficulty getting it to work, and the resulting troubleshooting comment I posted, it was a fully functional tab. While this is still pretty basic — Xbox news on top and scroll down to see a compact, yet fully clickable, version of the friends list you have on Xbox.com — I hope this is just a taste of the type of cross-functionality that we’ll see from Live Anywhere (Gamasutra: “Q&A: Chris Early Breaks Down Microsoft Live Anywhere”) or whatever else. At least during the workday, I can just scroll to the tab to see who is online (especially across different time zones) during the day and what they are up to. It’s nothing beyond mere curiosity, but I could see the potential in sending or receiving game invites over Messenger, especially if with one click it launches, say the Shadowrun session or whichever other Windows Live game. For the past few months I’ve been in close contact with a few of my colleagues in the Tokyo office of my company and, through them, with Shigeo Tatsumi, Xbox.com Japan Webmaster and community manager of sorts. Part of our conversation have been about sharing information and thoughts about expanding the community relations that Shigeo has been doing for some time already in Japan. When we last talked in early June, Shigeo planned to take the already smart things he has been doing since the launch of the original Xbox to a new level in early July. That time is finally here.Taking a cue from the creation of the Gamerscore blog, Xbox Japan has launched an employee blog for all things community related in Japan. 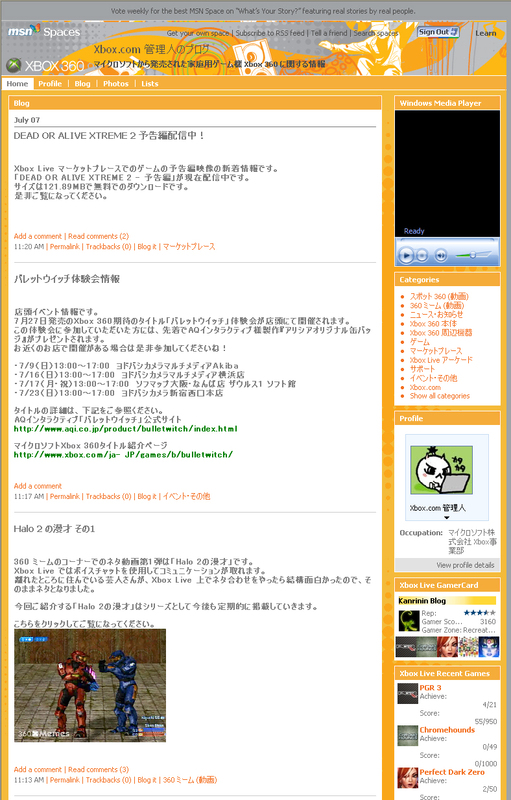 Right now, only Shigeo is writing on the blog, but that might change in the future. So far, he’s posted a lot of things already — from upcoming demos (Zegapain XOR) to videos about the quick charge kit (he’s in the video) and what seems to be a Halo 2 comedy routine to just posting what is new on the Xbox Live Marketplace. I’m interested in seeing where this goes, but I think Shigeo is off to a great start, mixing his own vision with the usefulness of a more official version of MajorNelson.com and the aforementioned Gamerscoreblog.com. I’ve already got this as an (unfortunately) auto-translated bookmark on my daily list of sites to check out. 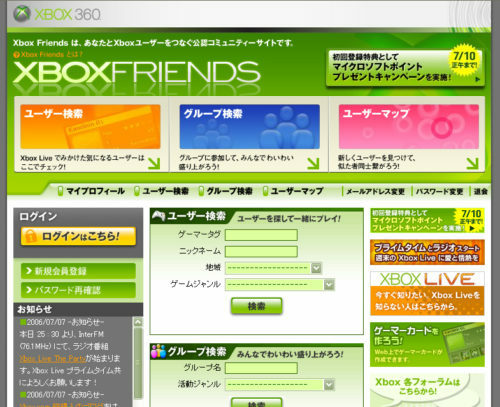 The other part to the community program in Japan is the launch of the Xbox Friends web site. 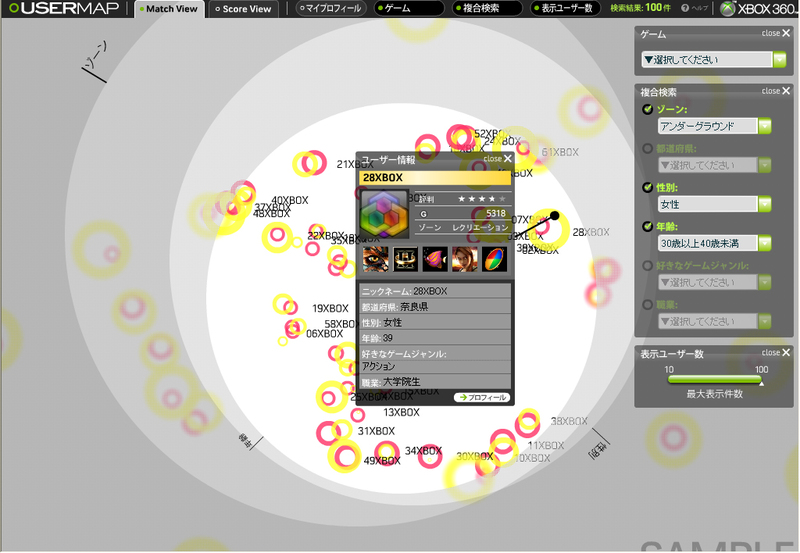 Social networks and networking are fairly big in Japan and it seems a lot of people are connected with their friends in a lot of different ways (in Japan and in the rest of the world naturally). Of course, Xbox Live is supposed to add another way friends all over the world are connected. The challenge in Japan seems to be that just randomly running into someone on Live, who may not even speak Japanese, to play a game with — never mind actually put on your Friends list — is an awkward social situation more often than not. This is where Xbox Friends comes in. From what I understand Xbox Friends basically looks to supplement the existing friends list features on Xbox.com to help gamers in Japan find new friends that share things in common by including information not available on Xbox Live such as prefecture, age and profession among other things. This information was willingly given by the gamers in order to join Xbox Friends, since that’s the whole purpose of the site. On Xbox Friends, gamers can create groups such as clans, guilds, student clubs, etc. and they can also search these groups. On home page for the Xbox Friends site itself, there are three main tabs for search: user search, group search (search for gamer groups according to game genre) and user map search. This is what the most interesting part of Xbox Friends is — the “user map” function. Basically, you start with selecting a game title and then on the next page you can choose to narrow down your user map search by a few categories. 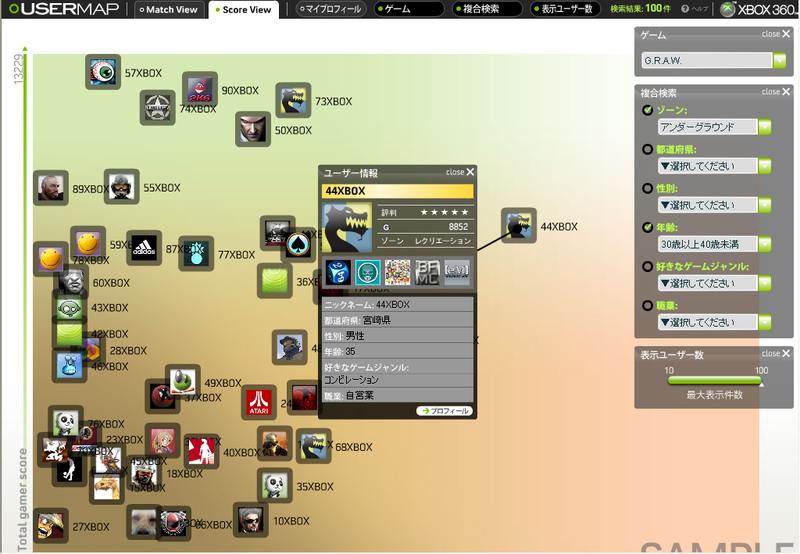 They include: Gamer Zone, prefecture, gender, age (minors cannot be searched), favorite game genre, and profession. The search result is a Flash-based user map and the type of user map you get — score view or match view — depends on what criteria you did or did not select to search by. You can also narrow down the number of results returned by using the 10 – 100 slider bar on the right side, so that the user map you get isn’t too busy and you can pick out a Gamertag to choose from to view. From these results, gamers in Japan can now find someone to request to be a friend on Xbox Live and not have it totally be random. It’s definitely a great idea and something that is needed out there. I hope that Japanese gamers put it to full use. One of the things I’ve consistently heard on NeoGAF has been the recent dearth of content on Xbox Live Arcade, considering announcements made at GDC back in March and at E3 in May about what was in the pipeline. They were setting the stage for Xbox Live Arcade, and by association, Marketplace, to have a significant amount of content by the end of the year. Then people started to wait for when the Marketplace floodgates would open and they would unfortunately wait longer than they thought. I’m really looking forward to Galaga, that has been one of my favorite arcade games for a long time. Except this time I won’t have to put real quarters in it over and over again! I was able to meet Che Chou a couple of months ago while I was over Millennium Campus on Xbox business. He’s a great guy with a storied career in video game journalism which ended, for the time being, at 1UP after he was hired to be the community manager for Forza Motorsport 2. 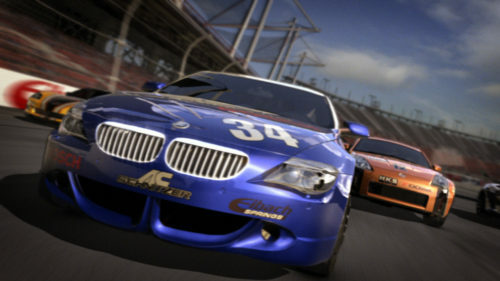 Part of his work has been blogging regularly on ForzaMotorsport.net to chronicle the development of Forza Motorsport 2. He is definitely one lucky guy getting to sit in on things like recording engine sounds during dyno sessions of heavily modified cars. Being a driving enthusiast himself, with a nice Audi B5 twin-turbo S4 to boot, this must be an awesome job to have and I’m sure he can’t wait for the team to do a repeat of their Track Day. Forza Motorsport 2 is one of my more anticipated games to come out later this year. I got into first Forza Motorsport some time after it had been released, but I still absolutely love it. I’m a big follower of (some kinds) of motorsport, specifically Formula 1 and World Rally Championship, although I do like some of the endurance races (Le Mans, ALMS, etc.) 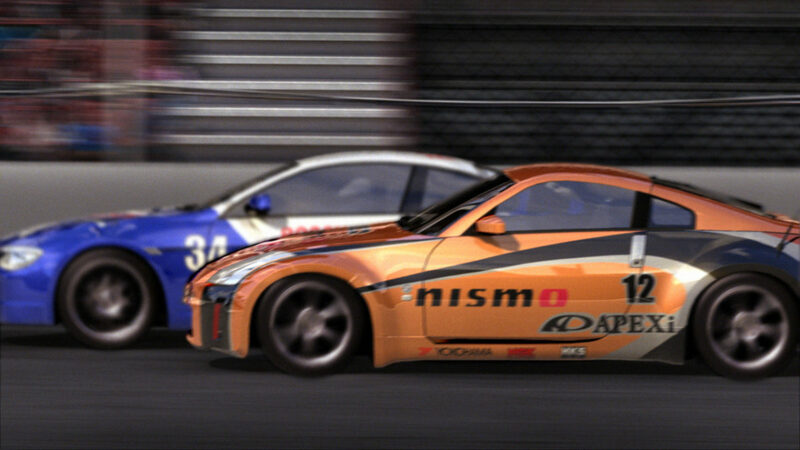 and assorted GT races as well. Because of the types of racing I like, Forza was a game that really spoke to me, covering a wide range of car types from all sorts of nations on road courses… it was just missing a great force feedback wireless wheel to complete the experience. That’s what is going to make this release of Forza 2 so great, because there will be a force feedback wheel released and it will be wireless to boot. This week’s update on ForzaMotorsport.net followed Che down to watch and record audio of cars being crashed into all manner of barriers for the game. Must have been an incredible sight! Even though he couldn’t join Turn 10’s big guns who got to head over to France for Le Mans this weekend, Che is still going to witness some incredible stuff as part of the development this year. I’d keep an eye out on what he’s up to every week. Details and breakdown of the Spring 2006 Dashboard update for Xbox 360.